Second Life can be a euphoric experience. It offers seemingly unlimited possibilities for identity, for creation and for friendship. Land can be bought quite cheaply, and one can either make or buy the house of one's dreams, as well as everything needed to get comfortably installed. By joining a multitude of groups one can build an ever-growing personal network of friends and associates. Thus one's avatar moves into the virtual world, invests time and energy, and develops a life. But there seems to be a down side. Sometimes when I log off, I am filled with a vague sadness, a sort of anguish. After a particularly severe bout of such feelings, I logged back in, and found someone to chat with. "I've got the Second Life blues," I said. "Does that exist? Does anyone talk about it?" But my friend changed the subject. I thought about this anguish, and found a number of plausible explanations. The virtual world is a place in a very literal sense, and behind the avatars are real people. But the virtuality gives this place and these people a set of highly specific attributes, some of which are, to say the least, inconvenient. One major attribute of places and people on Second Life is that they are impermanent. Builds can disappear from one day to the next, and whole sims can drop out of the virtual world. Avatars in the best of cases tend to be intermittent, and in the worst cases just disappear, either for extended periods, or permanently. How many times have I logged in to find my sim completely empty, because the avatars are off-line? 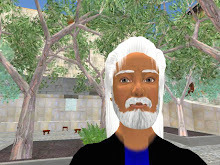 And in my short Second Life I've already seen a number of avatars take their leave, the consequences of which can be exacerbated by the anonymity of their real-world identities. After one of these departures I asked a friend if there were any known reasons for the sudden withdrawal. The friend only said: "Oh, you get used to that here. The key word in Second Life is 'Second.' Avatars come and go, and that one will probably be back sooner or later." But some never come back. To the extent that there is a second life, there can also be a second death, and cases of virtual suicide. Anonymity is another attribute that can have social side-effects. It is well known that the anonymity of on-line forums tends to transform certain participants into trolls, those Internet monsters who procure vicarious pleasure by triggering flame-wars with other forum users. Relationships with other avatars can be similarly brutal, unpredictable and emotionally dangerous. Anonymity can bring out the worst in people, because the lack of social constraints allows them to behave in ways they would avoid in real life. Has this phenomenon of "Second Life Blues," and its causes, already been scientifically described by others? If not, I claim the invention of the term. Medical syndromes are often named for the doctor that first clinically observed them. If Doctor Danton is the first to write a blog post that gives a precise clinical description of avatar malaise, it would be fitting to call the described set of symptoms "Danton's Syndrome." I think it's very important that you are writing about these experiences and attempting to classify them. I don't think it's fair to say that everything is impermanent in SL. By owning land, you can keep things very permanent. I take pride in having maintained things exactly as they were 3 years ago precisely because I want virtuality to have more permanence than real life. But the depression you experience I think is related to something else: attention, and the over-excitement and fatigue that comes from maintaining it for long periods and then shutting it down. Second Life, especially at the beginning, holds people very rapt, especially if they embark on very long log-on sessions trying to create something with the wonky tools, or having some deep intensive personal relationship. So they can easily sit at their computers for hours on end without moving, which inevitably makes one feel tired, cramped, and depressed when getting up. The other piece of it is that everything in SL goes very quickly, emotions and activities are accelerated, and that seems to burn a kind of emotional fuel, depleting the spirit, or leaving one feeling very keyed up, but tired underneath. I think of SL as kind of like "the bends." There is a very real thing that happens with virtual immersion, and going into it and out of it creates that sickness that people get trying to come out of the deep ocean too fast. In time, you adjust to it and tab it down like any other application and don't feel so pressed to answer every IM in real time or constantly watch what's up. No one has really studied how people are affected psychologically and physically by games. One problem is that the gaming industry works very, very hard to prevent such study and to spin any negativity associated with games (say, a parent leaving a baby to die, a murder, a suicide) as completely unrelated to game play. So when a gang formed in an online game in Russia erupted into real life and wound up killing a fellow game player, all the game blogs rushed to say it was unrelated to Lineage. We all know that's crap. The emotions that people experience in virtuality are so intense that they are feasibly quite capable of murder over some real or imagined loss or slight. Eventually, this will be studied, as more and more people become involved in it.